Webinars have become one of the most powerful tools for companies looking to create a trustworthy brand reputation, build credibility and establish themselves as experts in their field – while attracting customers at the same time. There has been a huge demand for businesses to start producing webinars as people are beginning to recognizing their benefits. If you’ve decided to take on the challenge of hosting a webinar in order to drive sales, diversify your range of services and showcase your expertise on an international platform – you’re going to need a solid plan of action. Follow these tips to ensure that all of the hard work you put into your webinars leads to a successful outcome for your online business! The first point for you to consider is ‘what do you want to achieve through hosting your webinar’? If you do decide to host a webinar, you need to think about what you want your business to get out of this? Nowadays, many businesses rely on self-promotion to generate a following online, generally this is not enough in order to be seen as an expert in your field. You can’t just tell people you’re an expert, you have to show them and that’s where webinars can help. If you have prospective clients that are signing up to your webinars, use it as an opportunity to showcase your value. Once they trust your expertise and competence, they will be more likely to want to engage with you. Content marketing material such as webinars, generate three times as many leads as traditional outbound marketing and costs 62% less, so webinars can be a powerful tool for sourcing new clients. Webinars are also great for establishing trust between you and your viewers. Having face-to-face interactions, and engaging with your audience is far more personal than written correspondence. It provides you with an opportunity to develop a good relationship with your prospective and existing clients. Another reason businesses use webinars is due to their potential for increased knowledge retention. Studies have shown that just 10% of information is retained by text as opposed to visual content, where 95% of content is retained by viewers. 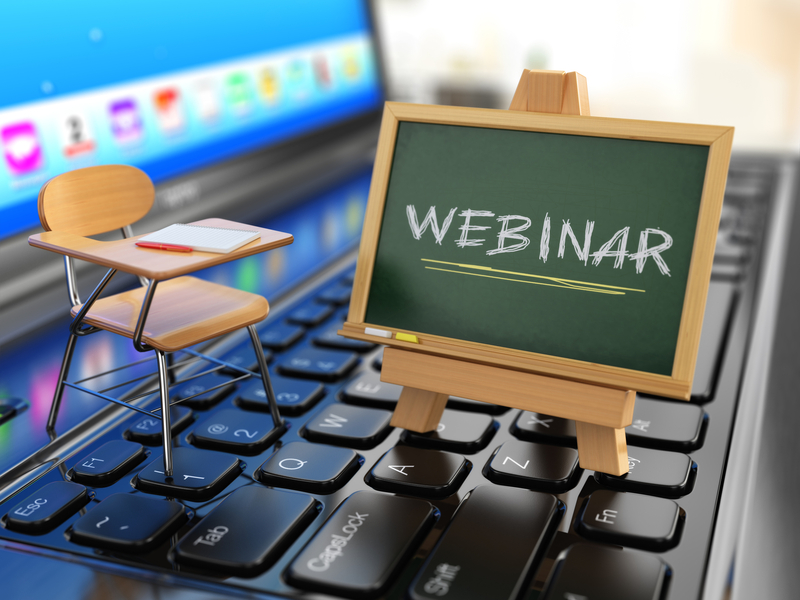 Webinars make for a more memorable experience for your viewers which is key in maintaining their attention and effectively engaging with your product/ services. Feedback is a key feature for any business looking to improve their products, services and webinars. Interacting with your audience allows you to better understand the affordances and constraints of your services, source valuable information and ensure a helpful line of communication is maintained between you and your prospective clients. Your next task involves choosing a topic for your webinar. Too often the decision making process revolves around – what do I want to say, rather than considering, what to they want to know? When deciding on your topic, you need to ask yourself: what is my area of expertise and what do people want to know about it? What is my most popular product/ service? What is my most interesting product/ service? What are the top 3 questions people ask me about your product? You need to introduce yourself and any special guests at the begining, provide a very short statement about yourself and your professional qualifications. Provide an opening statement about why your topic should matter to your audience. Use statistics and case studies to provide evidence and really drive your points home. Summarize your main points and anything that you’d like your audience to remember from your presentation. Hold a Q&A session at the end where the audience has an opportunity to ask questions about things you might not have explained clearly, or a subject you might have missed. And finally, include a call-to-action at the end. You may want to sell another service, a book you’ve written or the next episode of your webinar series – either way, make it clear to the audience about why this additional content is so necessary for them to hear. There are a few different ways you can host your webinar, but remember, it’s important for you to choose the method that you feel most comfortable with and is most suitable for your topic. The presentation method is good for presenting more complex or lengthy topics as they are easier for audiences to follow. Screen sharing is good for a more demonstrational approach. For example, if you are showing your attendees how to navigate a computer program. 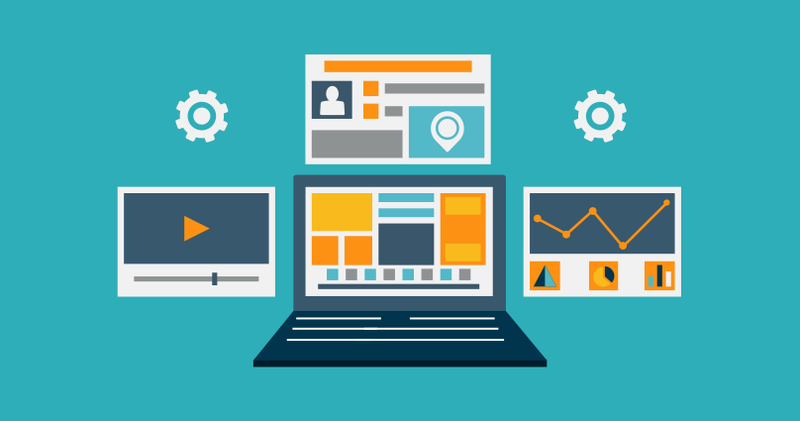 Some webinar software will let you use a combination of methods to present your webinar. If you do decide to use a combination, make sure you are adding to it in a positive and purposeful way. Another tip for adding engagement is to consider introducing special guest speakers. Introducing a guest speaker is a great way to add value and interest to your webinar by providing another perspective on the topic. Another important tip to remember when trying to create an interesting webinar is that if you flood your audience with information, ideas and concepts they will only retain a very small amount of what is being said, which means all of the effort you have put into the presentation is wasted. Your aim should always be to simplify. If you Simplify complex ideas, break them down, give it to them slowly, and check in with them to make sure they understand, the audience will have a far better understanding of the content and a more positive overall experience. Next, you need to think about how you’re going to promote your webinar and who is going to be interested. Email Marketing: you can send out an email to your existing client list to let them know about your upcoming webinar. Spend time crafting your emails so they sound like unmissable events. Social Media: social media is a great way to promote your webinar. On Facebook, you can create an event for your webinar, and invite your entire friend list. You can also create promotional advertisements and share them on Twitter and Instagram. You can use paid advertisements for your webinar through platforms such as Google Adwords or Facebook Advertising. Video Marketing: you could create a promo video for your webinar so viewers can get a comprehensive understanding about what you will be presenting, and highlight the points of interest to draw customers in. For a small business looking to appeal to a large range of prospective clients, scheduling is key. If you’re talking to international group of people, or even a group of people from different states, time-zones are certainly something to consider. The more universal your scheduling is – the more attendees you’re likely to have. It’s also best practice to host your webinars throughout the working week, on Tuesdays, Wednesdays or Thursdays in order to gain interest from as many people as possible. Ideal times to host a webinar are usually around midday between 12am and 2pm. There are a few ways that you can host a webinar to engage with new prospects and showcase your expertise to the world but visual presentations are arguably the most engaging way to do it because they expose the audience to a dynamic range of visually engaging content that they wouldn’t otherwise get through webcams or screen sharing. In order for your webinar presentation to really be effective, you need to incorporate a variety of tools and techniques to keep your presentation fresh and engaging. Creating a presentation involves the careful consideration of design concepts, branding elements and engagement tools as well as the arrangement of all of these elements to create the most effective presentation you possibly can. Follow these rules below and you’ll have a killer presentation that’s going to help you take your webinar to the next level. The first element you need to make a decision about is your theme, which is the overall feel of your presentation. All of your basic design elements will be chosen with regard to your theme. Typically, themes are chosen with careful consideration of the content and topic and bring about cohesion between different elements. For webinar presentations, the best themes are often the ones that you create yourself, which might simply be corporate, lively, feminine etc. as long as they focus on simplicity. Once you have a clear vision of what your theme will be, it will make all of your subsequent decisions much easier. Images are always a more engaging way to connect with viewers than text. Their ability to communicate is quite powerful and so it is important to know how and when to use them to maximize their effect. Images are great for examples and allow audiences to really see what you’re saying. They allow you to highlight the differences and create contrast between two subjects. They’re also great simply for decoration and adding interest to an otherwise unappealing slide. Building a presentation is a huge task. After you’ve decided on a colour scheme there’s fonts, images and layouts to worry about and for a small business owner it can be an extremely time-consuming task. Templates are a great tool for you to use if you want to cut down on time spent designing your layout. They are also good for people who aren’t particularly gifted when it comes to design, because the templates are often created by industry professionals anyway. As discussed in previous episodes, when hosting a webinar, you present yourself with a valuable opportunity to establish credibility, present yourself as an expert within your field and build your reputation. When you’re conducting your webinar, it’s important to make sure that your expertise is rightfully being attributed back to you in order to receive proper recognition – you achieve this through branding. Your branding consists of your logo, taglines, color schemes, fonts and themes; it is a collection of elements, that come together to form an image that tells a story about your business. This image is then fed to customers who decide purely from what you’ve shown them, whether they want to engage with you, or someone else. And that’s why branding is important; because it is what sets you apart from everyone else and helps customers decide why they should be interested in you. When you are branding your webinar, design is a huge component. Branded colors, fonts and logos can all be stylistically incorporated so that your business receives the full effect of your content marketing. Be inventive and strategic with how you achieve your branding. Don’t overcrowd your webinar with too much branding, or you will risk losing the interest and trust of your customers. Use screenshots of your work as examples and link to other related content of yours such as blog posts for further explanation. Delivering a perfect webinar is not always easy. For one reason or another, even the most experienced presenters will sometimes run into issues of some kind. However, there are a few things you can do to identify these issues and plan ahead for them. The key to any good presentation is being prepared and knowing your content. These tips below are designed to help you eliminate any issues that may arise and allow you to deliver a knockout webinar. As a general rule of thumb, you’re definitely going to need: a webcam, a pair of headphones, speakers, a strong light source and an audio device such as a built in or external mic. The key to perfecting your audio is ensuring you’re using quality equipment and to check how everything sounds beforehand. Test different settings, levels, angles and distances to find what works for your voice. Note that if you’re in a noisy environment, any noise will be picked up in your mic which can be distracting so be sure to eliminate any outside noises as best as you can. When you’re setting up your webcam, check that your camera is properly positioned. Other than straight on, some suggest that the most flattering angle to have your camera at is at forehead height and slightly tilted down, this way you can see your whole face clearly. Now, this is of course not the only (of even the most effective way to present a webinar). We suggest that introducing yourself to begin and then switching to a presentation is far more engaging for audiences. Your lighting can consist of natural light if you’re in a bright room, some lamps or light stands or an external lighting kit. Dark settings equal poor quality and poor vision so it needs to be plentiful regardless of the source. Three point lighting is ideal for shooting a single subject, where two sources are placed on either side and one above or behind the subject to eliminate shadows. During the webinar, don’t waste time on unimportant information.This means sticking to your script and not veering too far off topic. Off-topic distractions limit that time and you could miss out on providing valuable pieces of information, so consider leaving questions until the end. Note cards are a great way to stay on track and structure your thoughts, just make sure you aren’t relying on them too heavily or your audience will know. Unlike regular presentations where your physical presence demands the attention of your audience, virtual presentations require much more to engage an audience because there’s more to distract them. They require movement every few seconds to maintain an engaging pace. This movement can include simple slide transitions or section highlights. Just be sure you don’t go overboard with the transitions or any kind of animated movement as they can appear glitchy and distracting to members of your audience with poor internet speeds. Focus on always involving your audience, tell a joke or a story intermittently especially if it applies directly to topics you are discussing. Don’t be afraid to think outside the box either eg. contests and case studies. This will make the information more relatable and memorable. 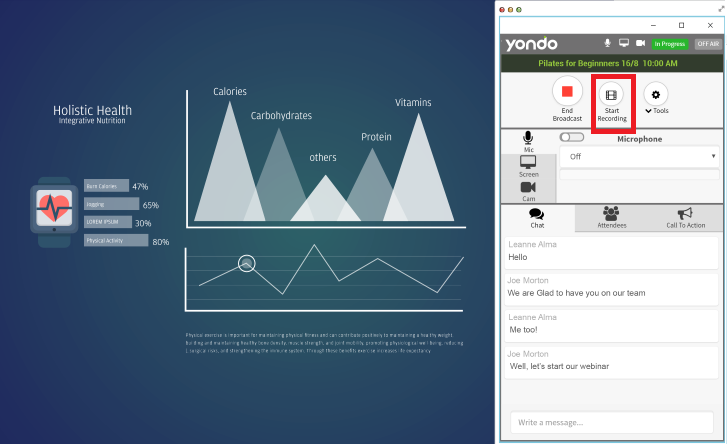 Yondo’s file sharing feature is good for that too where you can simply add an attachment and send it to all attendees beforehand. Also, ask your audience to share their thoughts, or personal experiences on a particular topic. People love talking about themselves and if you can get them thinking about your topic and how it relates to them, they are more likely to engage with what you’re saying. Remember to always be lively and active in your voice and tone. It’s not an audience’s responsibility to listen – it’s yours to make them and people will not connect with what you’re saying if you aren’t trying to be an engaging presenter. In terms of an ideal length, it simply does not exist. It’s entirely dependent on your topic and how much interesting content you’ve got to present on the topic. There are a few last minute things you can do to ensure your webinar runs smoothly and the first is simply practicing it a few times. You also need to familiarise yourself with the software before you get started to avoid any technical faults. Do a check of your workspace before you get started and make sure that your area is tidy and not too distracting. Make sure you’re well positioned, your lighting is good and your audio is working correctly because there’s no easier way to ruin a perfect webinar than having to adjust your equipment in front of your audience. Of course there can never be a 100% guarantee that you won’t have issues along the way, but it’s being prepared for them that can make or break your webinar. Stay calm, remain confident and know your content and you’ll be sure to present a killer webinar.